Hiraman (Raj Kapoor) and Hira Bai (Waheeda Rehman). Note Hiraman's reverential position. 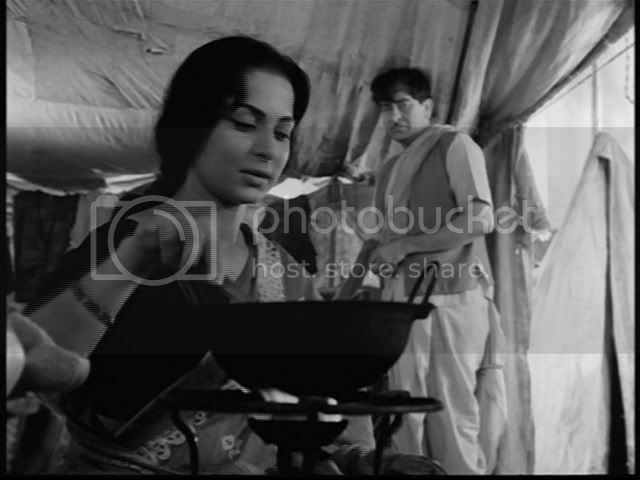 Teesri Kasam (The Third Vow), a gentle and melancholy film, is the perfect companion on a quiet evening at home. And its sweet and simple story resonates with the viewer long after its completion. 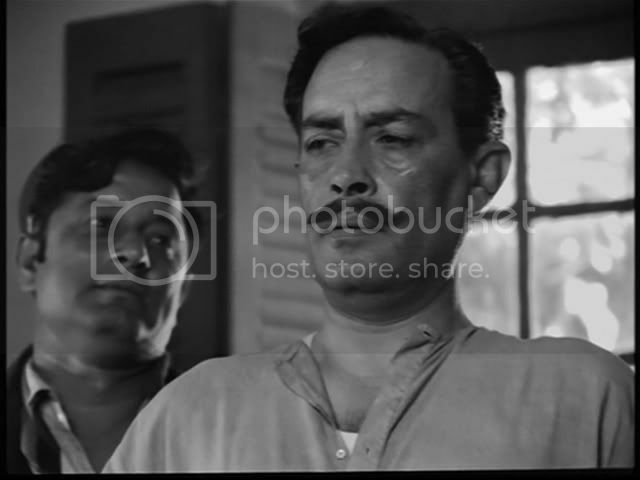 The PPCC could not help thinking how much Hindi cinema has regressed since the Raj Kapoor days, since - like Awaara - this film is more sensitively presented and intelligently executed than anything recent we've seen (including the Parallel Cinema films!). Of course, like many an excellent Hindi film, Teesri Kasam bombed and apparently led to the producer's financial ruin. See how the populists punish! 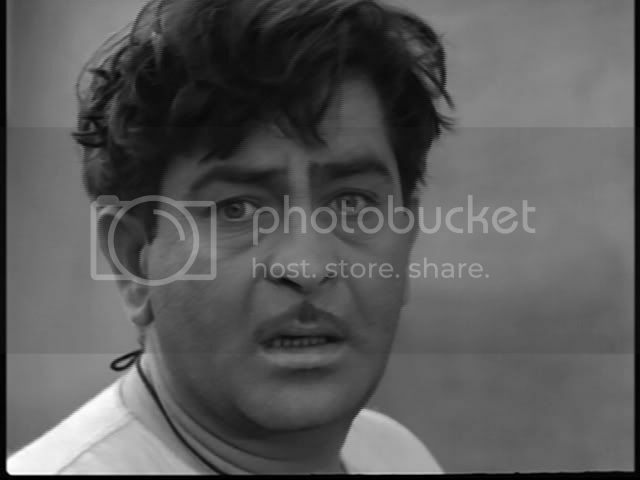 Raj Kapoor looked cute with ruffled hair. But it was a bit hard to buy that he was an ignorant peasant. I mean, look at those intelligent eyebrows! Somewhere in rural India, a cart driver, Hiraman (Raj Kapoor), is caught transporting illegal goods. He narrowly escapes imprisonment and makes his first vow: never to transport illegal goods again. Later, he takes a job transporting bamboo, and this leads to an unfortunate accident with another cart. After being beaten by the other cart drivers, Hiraman makes his second vow: never to transport bamboo again. One evening, a man approaches Hiraman with the request to transport a bundle for him some 30 km. Hiraman assures himself it's neither illegal nor bamboo-made, and agrees. That "bundle" turns out to be Hira Bai (Waheeda Rehman), an actress and nautanki dancer. Both Hiraman and Hira Bai are curious about each other, with Hira Bai clearly having the upper hand in terms of smarts and wordliness. Yet Hiraman's naivete and good nature charms Hira Bai, who asks him about his family and his home and, when discovering the similarity in their names (they both have hira, or "diamond", in their name), declares Hiraman her meeta (companion, best friend). Furthermore, what Hiraman may lack in education he makes up in emotional depth; Hira Bai is soon taken by Hiraman's genuine goodness and fab ability to sing evocative songs. The famous Duniya Banane Wale song being a good example. Who wouldn't be taken in by this? Sigh, oh, Raj Kapoor. Eventually, after thirty hours together in which a true bond has been formed, they arrive at the fair, Hira Bai's destination. 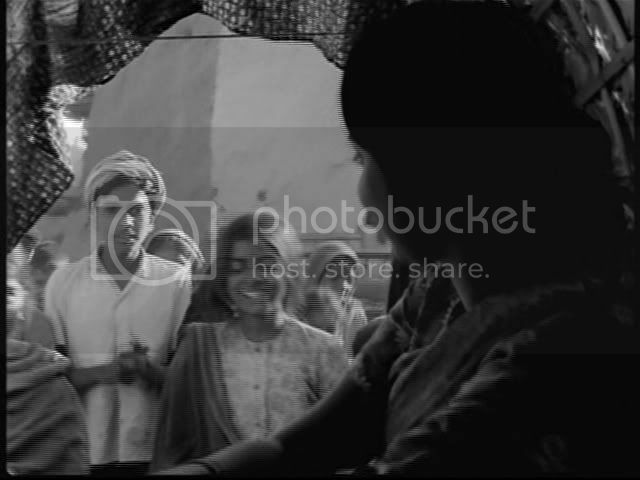 She invites him to watch her theatre troupe perform, and while Hiraman is coy - his sister-in-law expressly forbids him from watching nautanki - eventually he gives in, too awe-struck by the hustle and bustle of the fair to say no. But as Hiraman watches each evening's performance, he is slowly woken up to some grisly realities: namely, that Hira Bai's work verges on prostitution for many onlookers. Jealousy and intensity ensue, as it's clear Hiraman and Hira Bai are actually falling in L-word. Their already impossible dreams are further crushed when the local landlord and thakur, Vikram Singh (Iftikhar, OF ALL PEOPLE! ), solicits Hira Bai. We'll let you see how it pans out, but the titular "third vow" of Hiraman is heart-breaking. By this point in the film, we were feeling very emo. Iftikhar as a villain for once! Hiss! How far away this is from the mainstream Hindi melodrama! A plot like this could have been severely simplified and mishandled, yet - thanks greatly to the subtle performances of Raj Kapoor and Waheeda Rehman - the film is flushed with emotional realism. There are beautiful, carefully-handled details (e.g. Hiraman touching Hira Bai's shawl when the latter bathes) which are never milked more than they should be. The result is a relationship which is both very compelling but also very believable. Readers of the PPCC will recognize that this relationship resembles that other City Girl-Country Bumpkin pair from Jab Jab Phool Khile, released a year before. Yet whereas JJPK's Raj and Rita are stylized charicatures, Hiraman and Hira Bai are real, three-dimensional people. (Thankfully, the Hiras also lack that weird undercurrent of patronizing-ness that JJPK's lovers had.) The relationship is also thankfully not used to advance any social agendas, unlike JJPK which glorified the rural narrow-mindedness at the expense of anything progressive. Teesri Kasam offers an even-handed and sympathetic portrayal of rural India, but it also recognizes how the constraints of rural India can lead to much suffering on the protagonists' part. Another highly enjoyable factor was the enlightened gender relations. So far, this is the second Raj Kapoor film (after Awaara) we've seen where the woman is naturally equal to the man (if not a bit smarter, ha!) and it is only social constraints which bind her. Indeed the poignancy of Teesri Kasam comes from Hira Bai's difficult position: their relationship can't survive in a society where being a dancer and being a respectable married woman are mutually exclusive. But, positively, it is Hira Bai who chooses her destiny, painful as it may be, in contrast to the numerous other filmi heroines who have their destiny thrust upon them. Hiraman is likewise penned in by his ignorance and poverty; he is no match for the moneyed power of the local thakur. His slow realization of this is agonizing to watch. wow! our guy Iftekhar as a villain? This I have to see! Waheeda's iconic dance, paan khai saiyyan hamaro was another highlight of this movie. Bhojpuri dialect was used in the dialogues and the songs! A movie that breaks your heart. Well....though they dint stick to the true dialect...still...it was "maithili" and not "bhojpuri"...not every dialect from cow-belt is bhojpuri;)....the movie was based on a short story of the great maithili writer "Phanishwar Nath Renu". I have had this DVD for a long while but just got around to watching it. I too thought it was a great film. Great acting, great story, great songs, and I liked the cinematography too. The shots of the rural landscape and villages were really nice. Raj Kapoor was perhaps a little old for his character but it was easy to overlook given his heartfelt performance. Films like this make me want to watch more of Raj's and Waheeda's films!